December 17, 2010. Astoria, OR. From Portland we headed to the far northwest tip of Oregon to meet Caren Black and Christopher Paddon at the Titanic Lifeboat Academy, whose brilliant name has intrigued me since I’d encountered their website in 2005. Christopher and Caren have made their rural homestead into is a learning center complete with solar power and hot water, a wind turbine, extensive library, food gardens, goats, chickens, geese ducks, multiple compost piles and most especially, people who live a low-energy, more sustainable life. We taped a conversation in their barn’s second story EcoLoft, where they described how interns and work-study participants undertake personalized learning while helping with hands-on homesteading tasks. 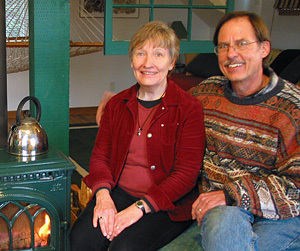 Weekend visitors can experience a crash course on sustainability by staying in their EcoLoft, and online students can work on their own resilient living plans. You rise and pick berries for summer’s breakfast, or stoke up the woodstove fire under winter’s heartier oatmeal. There’s literally wood to chop (if not water to carry), fields, garden, greenhouses, barn, coop and woodlot to work in, a large library to study in, and a couple whose experience and research can make for highly stimulating conversation and mutual learning over afternoon tea. Watch Titanic Lifeboat Academy – Navigating a Path to Resilience (episode 216).